The Oakland warehouse fire recovery efforts have been completed, officials said on Wednesday, with the death toll of people killed inside during a dance party Friday night holding at 36. That news came a day after Oakland officials declared a local state of emergency because of Friday night's deadly fire at 1305 E. 31st Ave. The city council is scheduled to ratify the state of emergency on Thursday, which makes the city eligible for state and federal aid as it copes with the worst fire in its history. 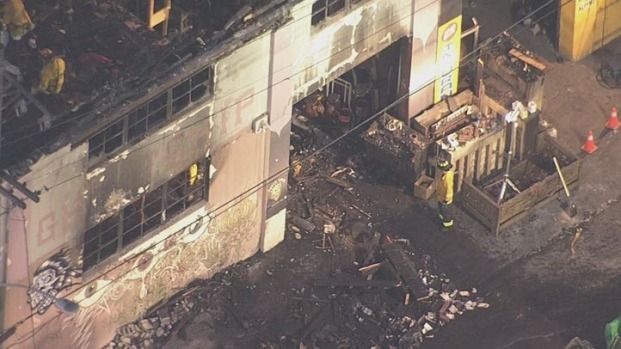 Meanwhile, investigators continue to work on determining what caused the fire at the so-called Ghost Ship warehouse, which had been illegally converted into living spaces and was hosting a dance party when the blaze ignited. Officials indicated a refrigerator or appliance was a potential source of the fire, but it was too early to say for sure. "The refrigerator is something that they’re looking at as a potential source of ignition," said Jill Snyder, special agent in charge of the San Francisco Department of Alcohol, Tobacco and Firearms. "It has not been identified as the smoking gun." Synder said the fire appears to have started on the first floor and traveled up two stairwells, trapping the occupants on the second floor, who were "consumed by smoke before they could get out of the building." 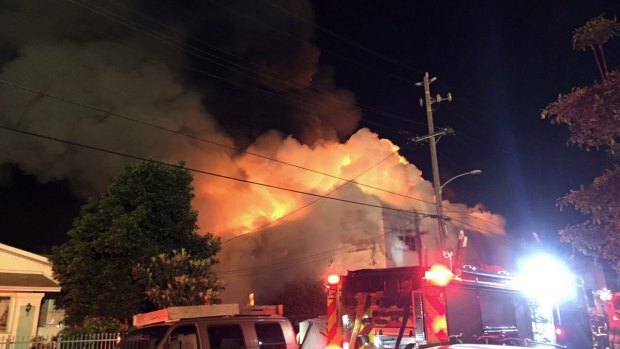 Oakland Fire Chief Teresa Deloach Reed said that fire crews will be on scene until they can "look family members in the face" and tell them the building has been completely searched, and no more victims have been found. On Tuesday, families of the loved ones lost in the fire were escorted into the area now being looked at as a crime scene. Alameda County Sheriff's Office Sgt. J.D. Nelson said some of the victims were found trying to shield each other form the flames. "They were both on the ground and what looked to be right next to each other," Nelson said. Nelson said most died from smoke inhalation, and that 35 of the 36 victims have been identified. Thirty families have been notified, Nelson added. "I hope in my heart it was fast and that they didn't have to suffer," Nelson said of the victims. In order to access the last 10 percent of the warehouse just before midnight on Tuesday, crews had to knock down walls in an area they already searched. "We are going to bring closure when they search the rest of the 10 percent," Oakland Police Public Information Officer Johnna Watson said. 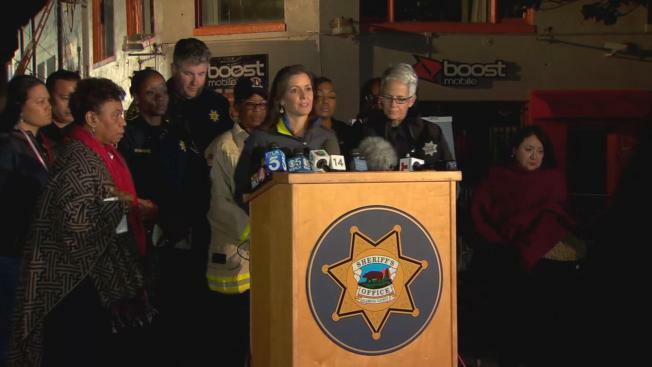 Oakland Mayor Libby Schaaf during a news conference late Tuesday also discussed past complaints about the warehouse. In 2015, the city received three complaints, including constructing housing without a permit and pallets blocking sidewalks, according to Schaaf. Jose Avalos lived in the warehouse. The 38-year-old artist said he shut the doors of his studio space inside the warehouse Friday night to keep party goers away. Officials allowed media a closer look Tuesday at the burned Oakland warehouse where 36 people lost their lives late Friday. "By the time I got the doors open flames were starting to engulf my space," Avalos said. Avalos believes the fire started in the back of the 1,000 square-foot building and quickly spread. "I know people saying they are looking into arson and thinking that someone did this maliciously, but I truly do not feel like this was a malicious act. Meanwhile, Avalos said he does not blame his friend, Derick Ion Almena or his wife, who ran the so-called Ghost Ship. But Avalos said everyone who lived there knew the dangers inside. "I don't blame Derick for this. I do not see how this is his fault," Avalos said. Public records will be shared with other agencies posted to the city of Oakland website on a rolling basis, officials said.